All models in the new M-Class range offer excellent comfort and superb driving dynamics as standard – both on the road and away from the tarmac. 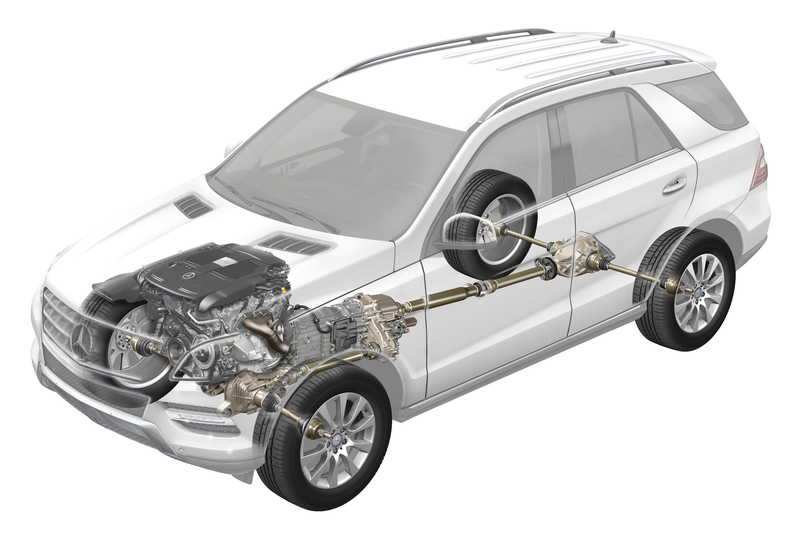 Besides the steel suspension with selective damping, there are also some new chassis developments and innovative dynamic handling control systems available, which are designed to make driving the new premium SUV an even more effortlessly superior experience. 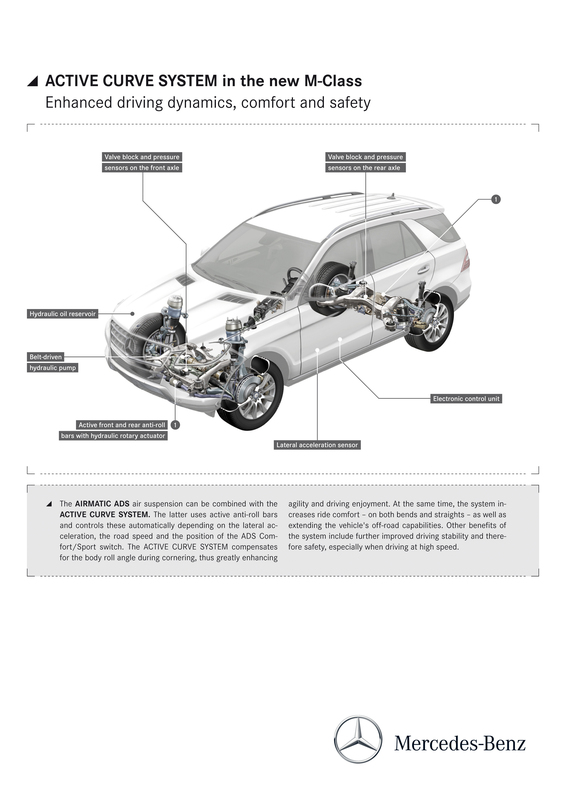 These include the AIRMATIC air suspension with Adaptive Damping System (ADS), the ACTIVE CURVE SYSTEM for active roll stabilisation and the ON&OFFROAD package with six driving modes. A comprehensive package of measures has also been included to ensure that the M-Class is at the forefront of its segment for acoustic and vibration comfort too. 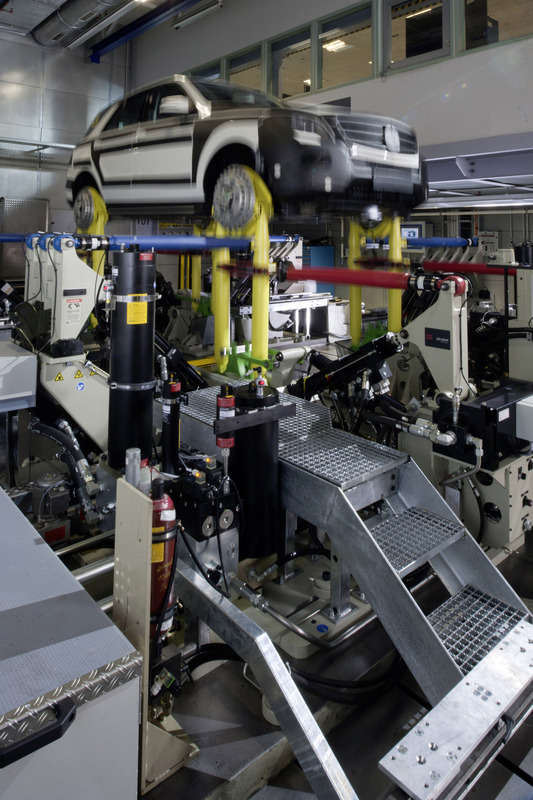 To ensure that the driving experience continues to be a complete pleasure after hundreds of thousands of kilometres, the development engineers punish both chassis and body in practical trials staged worldwide and in series of selective laboratory tests. Some of the toughest examinations here include the body testing facility and the road-simulation test rig. A high level of comfort, dynamic on-road handling and excellent off-road capability are ingrained into the new M-Class as standard. 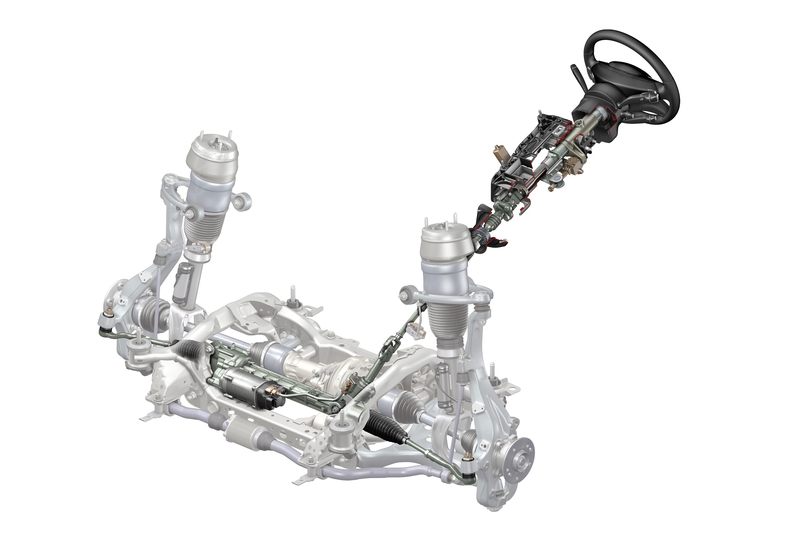 The chassis of the steel-sprung M-Class now includes selective damping for the first time, meaning the shock absorbers' compensatory forces are of a flexible nature, rather than having a rigid setting. 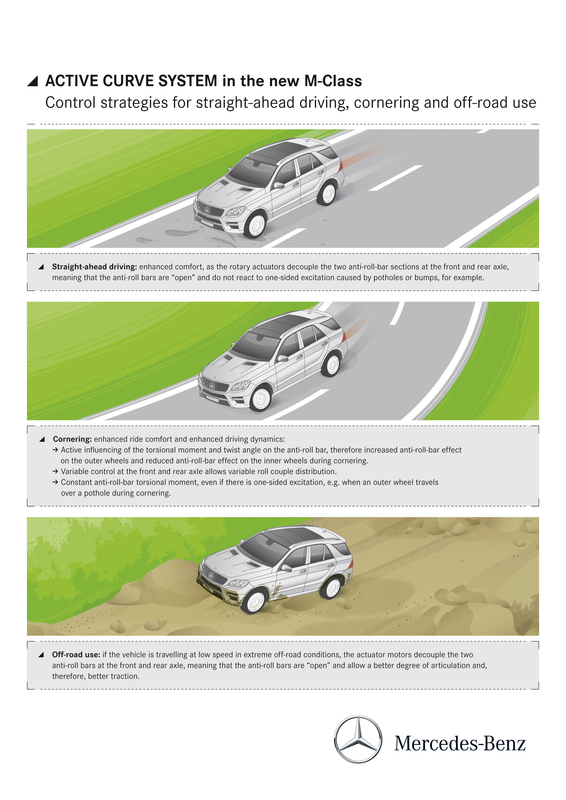 During normal driving on moderately uneven roads or off-road excursions at low speeds, the system is tuned for a gentler ride to the benefit of the occupants' sense of wellbeing and the vehicle's off-road abilities. In order to keep the occupants feeling at their ease when driving at a brisker pace or performing abrupt evasive manoeuvres, the dampers switch to a firmer setting in such circumstances for a high level of handling stability. The M-Class driver is helped here by an electric steering system that provides the optimum level of power assistance to suit the particular driving situation. 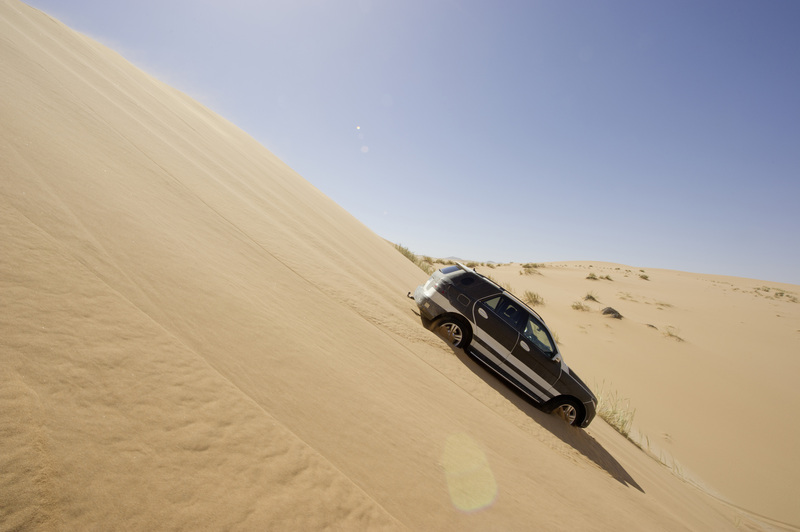 The system therefore makes light work of parking or off-road manoeuvres by maximising steering assistance. The SUV also scores here with the tightest turning circle in its market segment. The 180‑degree turn is negotiated within a circle diameter of just 11.8 metres. As the speed increases, however, assistance is reduced in favour of greater directional stability. 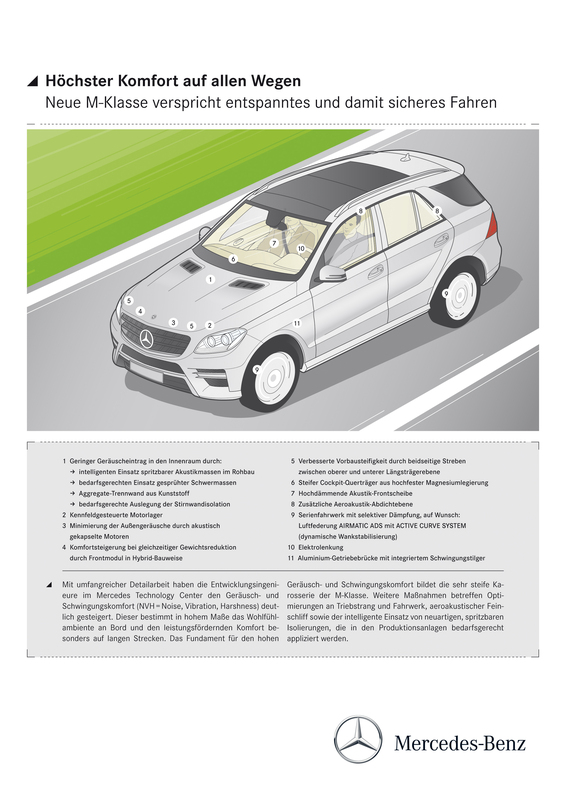 Start-off Assist and the HOLD function furthermore come to the driver's assistance when performing a hill start, while Downhill Speed Regulation, or DSR, enables the M-Class to automatically maintain the speed set with the cruise control lever on descents. For anyone wishing to go exploring off the beaten track even more in the new M-Class, there is the optional ON&OFFROAD package. 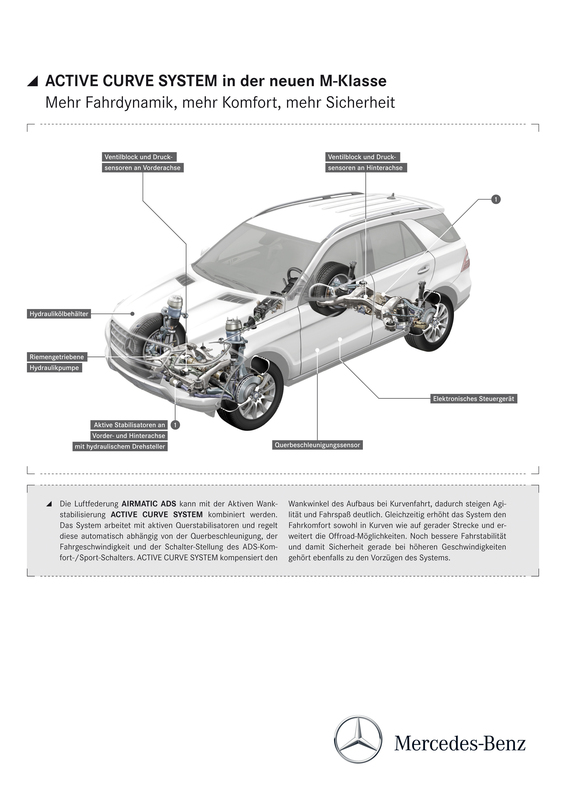 The current driving state is determined using a steering angle sensor, 4 turning angle sensors und the road speed as derived from the ESP®signal and the brake pedal switch. Based on these signals, the control unit calculates the current damping forces required and actuates the appropriate damper characteristic curves. The driver is able to choose between Sport and Comfort modes manually by pressing a switch. Increased ride comfort and more dynamic handling when cornering, because the system actively influences the anti-roll bars' torsional moments and twisting angles. The anti-roll bars' torsional moment furthermore remains constant in response to a stimulus on one side, such as is the case when driving over a pothole on the outside of the bend. 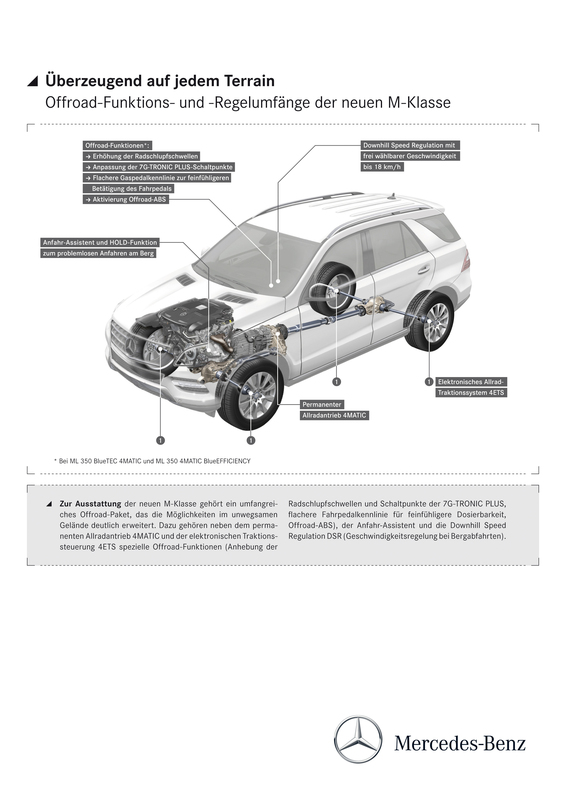 Thanks to the individual control at the front and rear axles, distribution of the roll momentum can be varied, allowing the self-steering properties to be actively adapted to the prevailing driving situation. The handling characteristics are adjusted for extra agility when driving along country roads and for even greater stability on the motorway. The ON&OFFROAD package for the new M-Class uses six different driving modes to optimise driving dynamics and handling safety by providing the optimum drive control needed to cope with the wide spectrum of operating conditions encountered both on and off the road. The added benefit compared to the Off-Road Pro Engineering package offered previously is plain to see: whereas before there was one optimum driving mode for the road and one for off-road, drivers now have the choice of an automatic mode, as well as two specially programmed off-road and three on-road modes. The specific driving modes for all-wheel drive resolve a conflict of objectives that has previously hampered further development of 4MATIC and the 4ETS electronic traction system as well as ESP® and ASR. 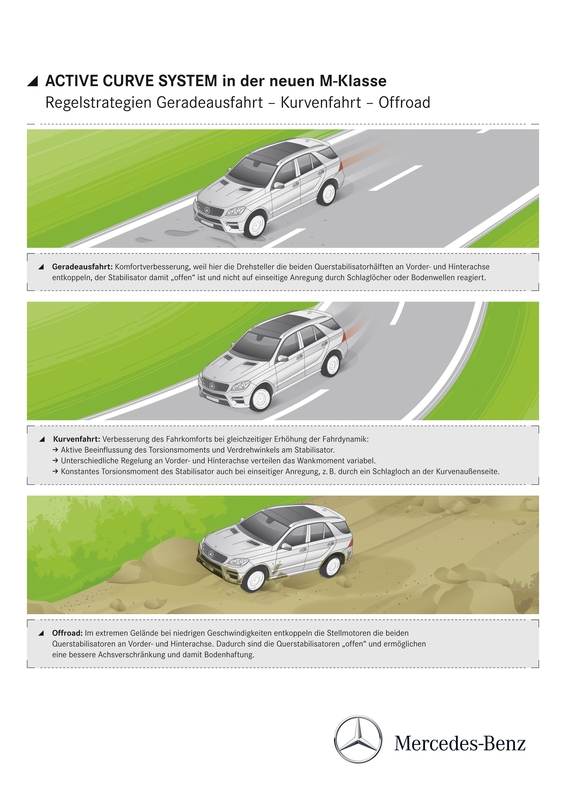 To take an example: on off-road tracks, it is important that the control systems respond very gently due to the low friction coefficients, but this makes a sporty setup virtually impossible. 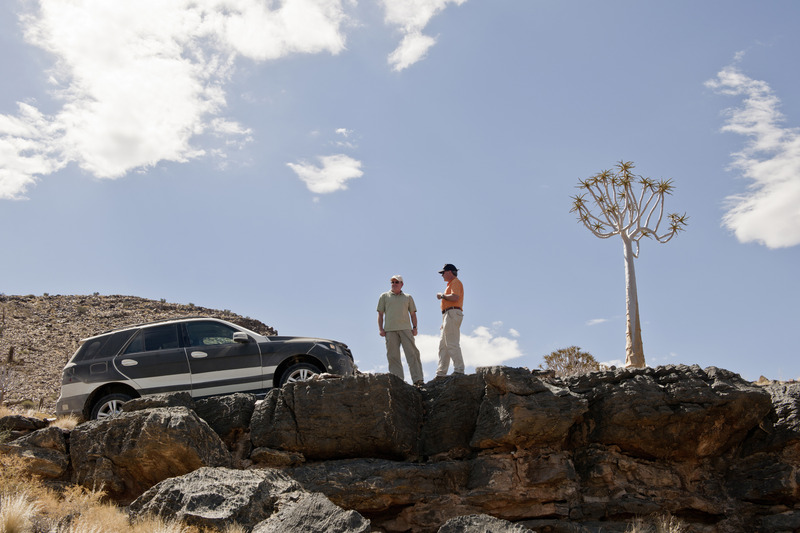 Conversely, a sporty basic setup impairs performance abilities in off-road terrain. In the past, the engineers always succeeded in finding excellent compromises which worked brilliantly under all conditions and continue to do so. 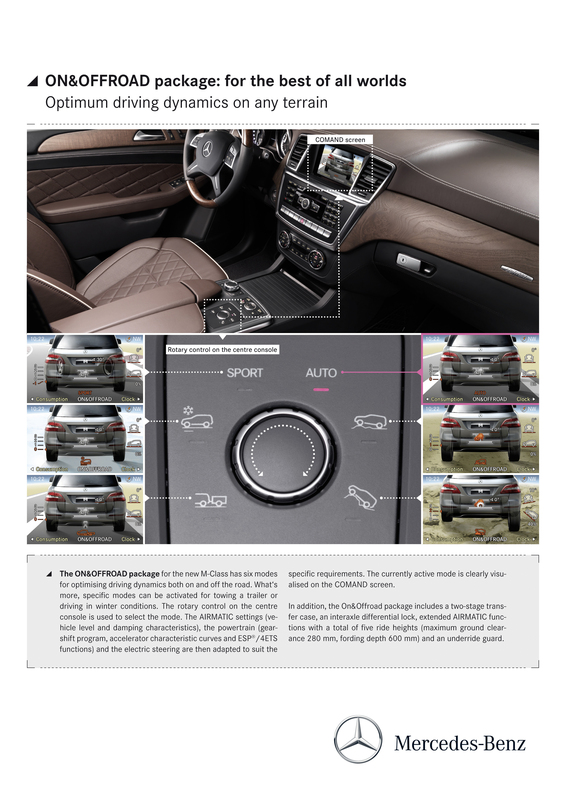 The new ON&OFFROAD package with its specific driving modes, however, enables driving dynamics and handling safety to be optimised almost as far as is physically possible under all operating conditions by maximising networking between the individual control systems. Despite so many options, the driver is never in any doubt about mode selection: the setting is made intuitively, while the driving mode selected is visualised in the multifunction display as well as in virtually photo-realistic quality on the screen of the COMAND system. If the driver selects the Winter mode, for instance, the display shows the M-Class in snow. The Sport setting displays a racetrack with red-and-white curbs, while images of off-road terrain with different profiles appear for Offroad 1 and 2. The display is interactive too: steering input and spring travel correspond to the actual values, while the graphics include additional information on the steering, gradient and tilt angles, the AIRMATIC level, the pre-selected speed for Downhill Speed Regulation (DSR), as well as the selected drivetrain settings including reduction gear and differential lock. Irrespective of which basic mode is set, the reduction gear, differential lock, DSR and the AIRMATIC system's level control can all be adjusted individually. As with the basic settings for the ON&OFFROAD package, it is not possible for the driver to make mistakes here either. Illogical settings, which would have a negative impact on handling stability, safety or traction, are precluded. If case of doubt, the system will revert to automatic mode. 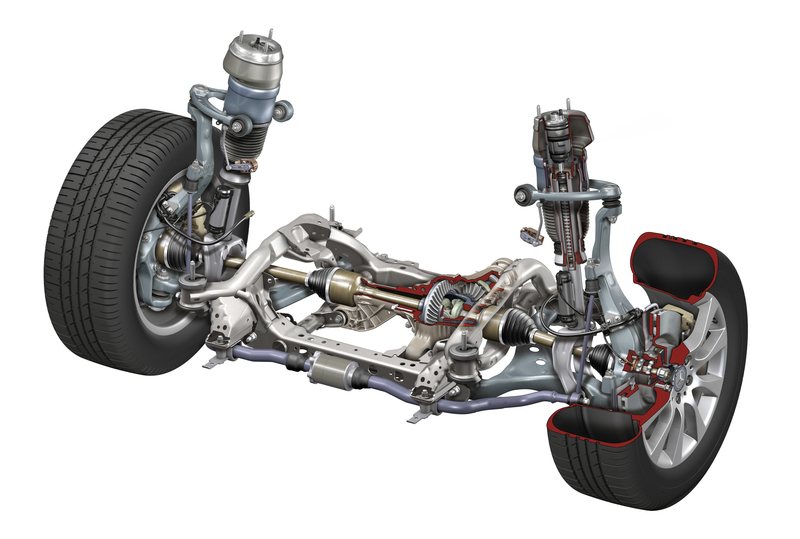 In terms of "hardware", the ON&OFFROAD package comprises an underguard, a two-stage transfer case with reduction gear, an inter-axle differential lock and enhanced AIRMATIC functionality that allows a maximum ground clearance of 285 millimetres and a fording depth of 600 millimetres. The new M-Class promises relaxed and therefore safe motoring under all possible (and even impossible) conditions. 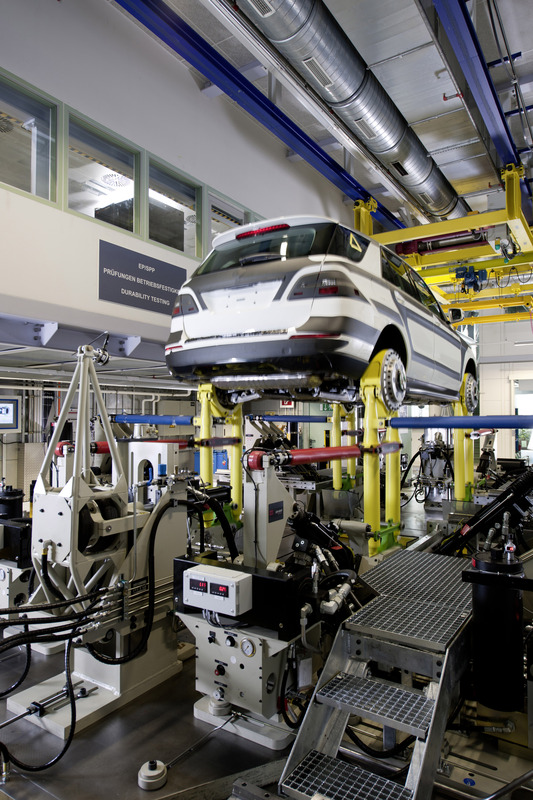 By paying close attention to detail every step of the way, the development engineers in the Mercedes Technology Centre have significantly improved what they call the NVH comfort level (Noise, Vibration, Harshness). This is a decisive parameter for the general sense of wellbeing on board, whilst also contributing to driver-fitness safety, especially on long journeys. The basis for the high level of NVH comfort is provided by the very rigid SUV bodyshell of the M-Class. The development engineers were faced with some particular challenges here. For example, they had to make allowance for the optional panoramic glass sunroof's large aperture in the construction. The objectives set for drive comfort were no less ambitious. 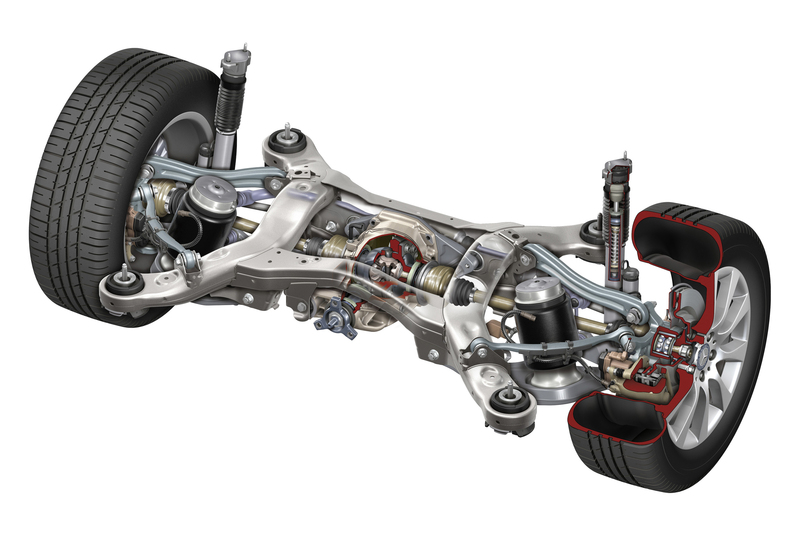 Substantial improvements have been achieved in this regard compared to its predecessor, thanks to features such as map-controlled, hydraulic engine bearings, a resized aluminium transmission cross member with integral vibration damper, as well as the overhauled 7G-TRONIC PLUS with twin-turbine damper and centrifugal pendulum. Potential noise penetration from the engine compartment through to the interior is minimised by a major assembly partition wall made from plastic and the intelligent use of soundproofing to suit requirements. Aero-acoustic enhancements include the vehicle glazing with its high-insulation acoustic windscreen, additional sealing in the side sections, plus the streamlined add-on parts such as the restyled exterior mirror housings. 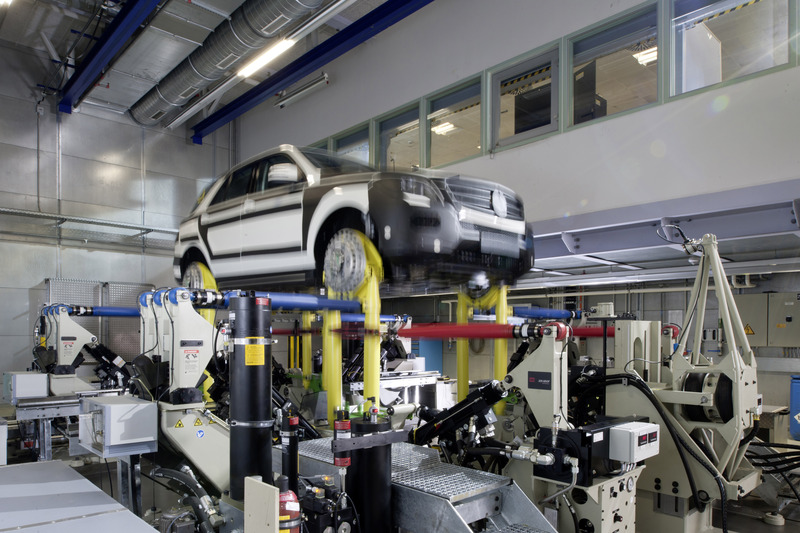 Intelligent use of soundproofing to suit requirements: In the production facilities, insulation is applied to the bodyshell very precisely by computer-controlled robots. Insulation with varying mass distribution in parts is used in the firewall area in accordance with the potential noise penetration. A totally dependable body and chassis systems that can cope with high levels of strain under even the most demanding conditions over hundreds of thousands of kilometres are particularly indispensable in an SUV such as the Mercedes-Benz M-Class, with its broad on-road and off-road performance spectrum. 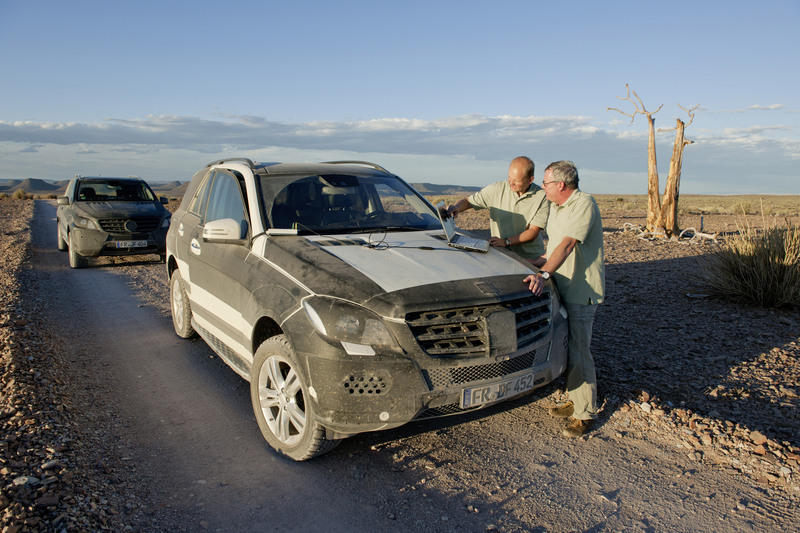 Besides practical tests with the prototypes, the engineers also subject the M-Class body to an exhaustive test of durability during the development phase that ranks amongst the toughest examinations in the world for body and chassis. Lasting several weeks, the load cycle covers a total of 3000 kilometres, which corresponds to an average of 300,000 kilometres of routine driving. This is because every kilometre driven on one of the state-of-the-art test rigs is 100 times more gruelling than in everyday driving. 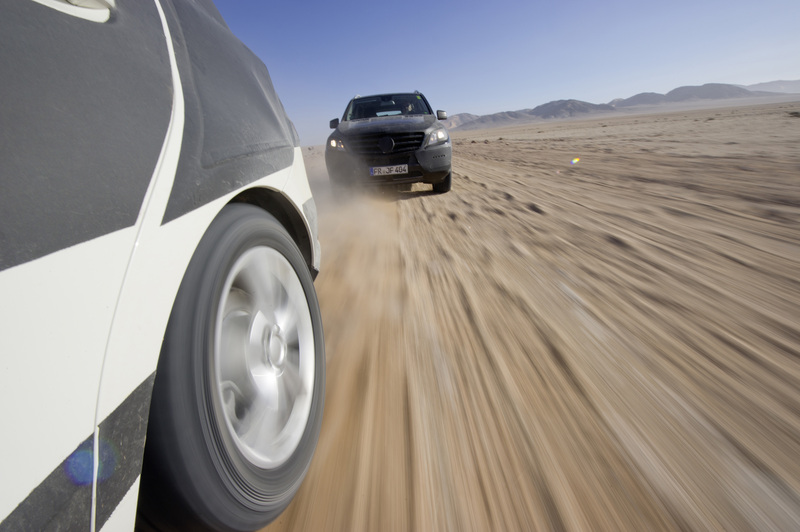 SUVs which come through this endurance test unscathed will be able to withstand the strain of a tough day's driving on and off the road in the M-Class. The test programme comprises various "load spectra", which the engineers refer to as virtual test tracks. The individual courses are not dreamt up by the team of testers, however. Instead, real routes were digitised, including the "Heide" test with its tortuous pothole and cobblestone sections, special off-road torsion drives with maximum torsion levels, and corrugated tracks in Africa with high-frequency excitation. 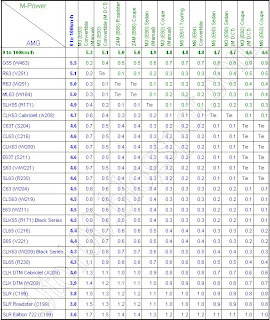 Computers orchestrate the sophisticated test rigs on the basis of this data. The rigs' servo-hydraulic cylinders mercilessly knock, jerk, shake and twist the bodies, just like on a real test drive. In all, 26 actuating cylinders arranged vertically and horizontally are responsible for stimulating the body on the test rig. A hydraulic system generates a pressure of 210 bar and pumps as much as 2000 litres of oil into the cylinders every minute. This enables the formidable forces of up to 20,000 Newtons to be produced, which shake the car thoroughly in quick succession at the computer's command. 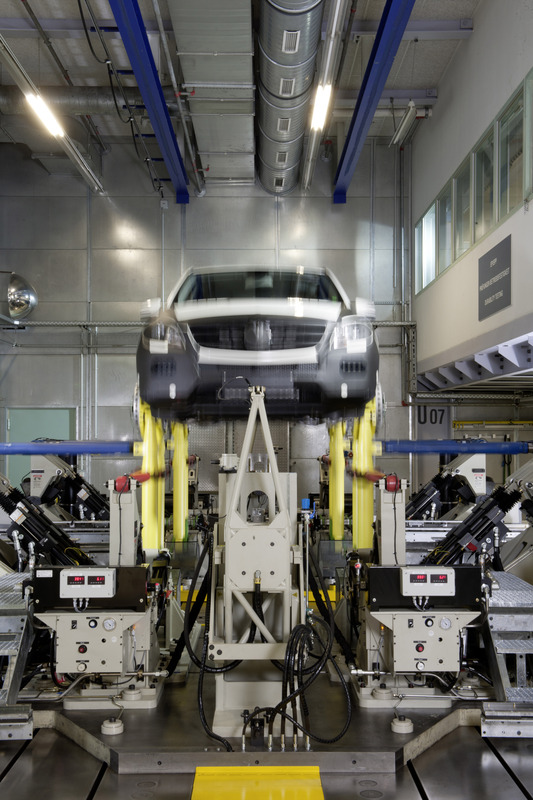 To allow them to detect any damage early, the Mercedes engineers halt the test rigs after around 100 kilometres each time, or when one of the 150 or so sensors that permanently monitor the vehicle emits a signal to automatically shut down the facility. The body is then inspected meticulously for the tiniest sign of damage. The experts are highly experienced, so they know exactly where the critical points are and what they should look out for. Apart from the weld points and bonded connections, the panels along the force transmission paths between the chassis and body are also carefully scrutinised, as these areas have to withstand very high forces in an SUV when negotiating rough roads or torsion sections. The candidate is deemed to have passed the endurance test if its body shows zero signs of damage. Even the finest of cracks, which can only be spotted with the aid of special fluorescent colours and under ultraviolet light, are unacceptable. The road-simulation test rigs are just as punishing as the body testing facility. 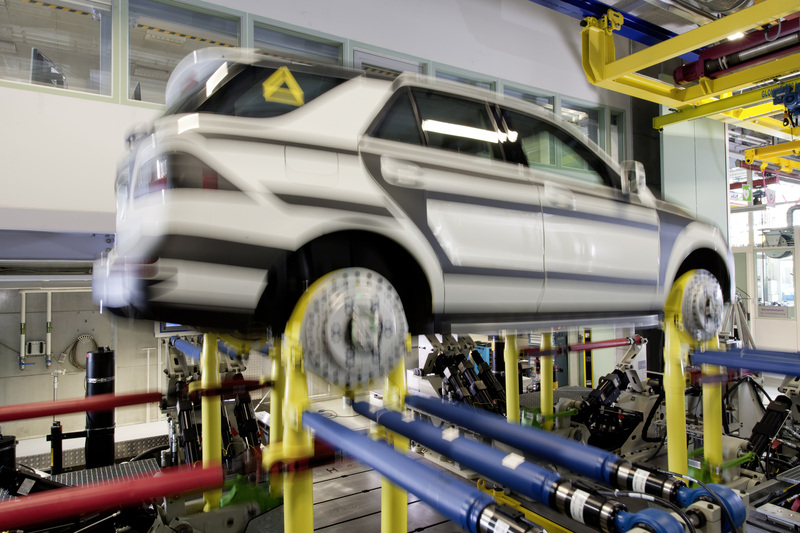 Applying identical load spectra over the same distance, the test engineers torture the M-Class chassis in all of its different variants here – from the basic steel suspension with selective damping to the AIRMATIC ADS air suspension to the version with the new ACTIVE CURVE SYSTEM. In contrast to the body testing facility, only the chassis is installed on the test rig here. The pivot points are fixed to the solid test rig frame, while the wheel hubs are connected to the servo-hydraulic cylinders using special mounting fixtures. 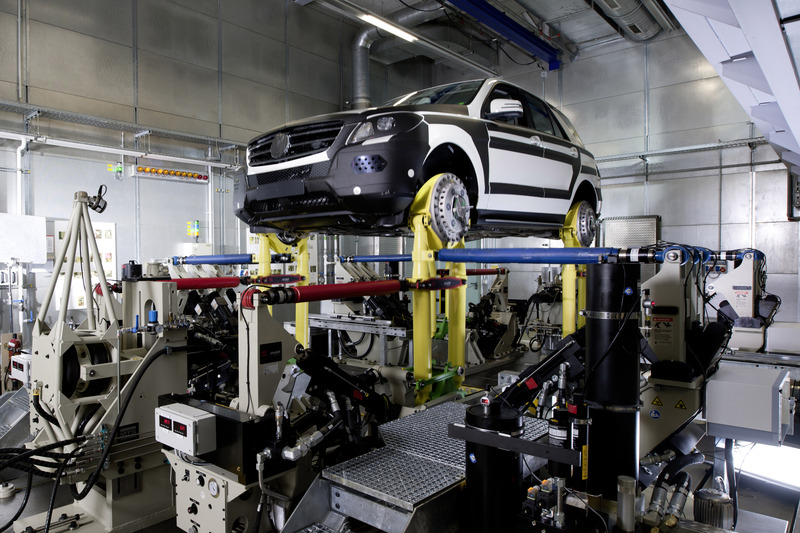 This test setup allows the complete chassis to be examined in isolation, producing even more exact findings. 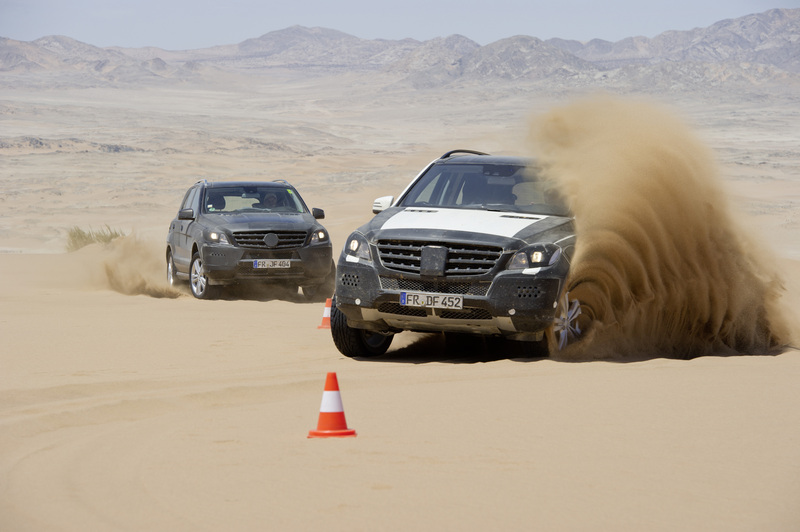 Compared to the testing for road-going saloons, the programme for a Mercedes-Benz SUV is far more rigorous. 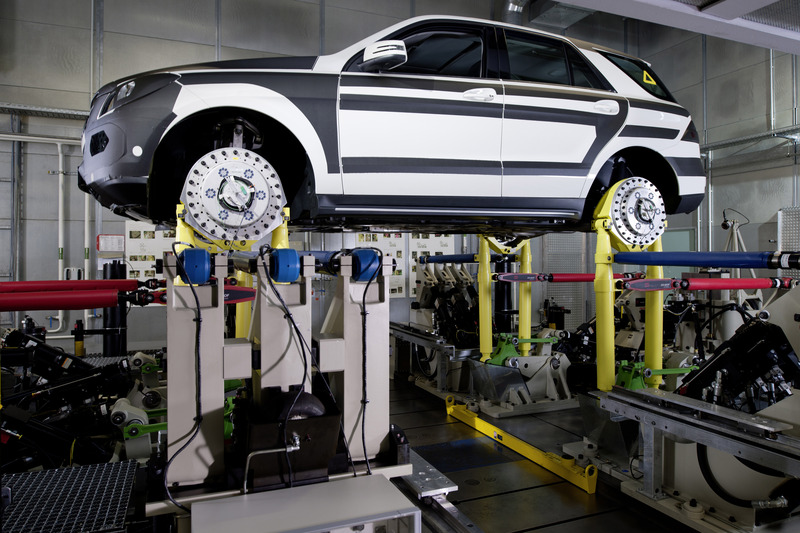 As with the body testing facility, the chassis is also subjected to all manner of different on-road and off-road load cycles. In contrast to real-life driving with prototypes, which continues to take place too, the constant laboratory conditions on the road-simulation test rig allow the engineers to analyse individual chassis parameters more effectively, and thereby take targeted action to correct any vulnerabilities found during development. The several weeks of laboratory testing staged over a distance of 3000 kilometres would take about half a year if carried out under real-life conditions.